The average cost of illegal drugs on the street is dependent on supply, demand, purity, and the type of drug. Illegal street drugs may also have social and emotional costs. Some drugs produce a long-lasting effect while others are short-acting. If a drug’s effects wear off quickly, a person is likely to take more frequent doses or mix it with other drugs. The cost rises. Over time, the body gets used to a certain dosage and the drug begins to have less of an effect. Tolerance leads to higher doses, also increasing the cost. Someone with a high tolerance who is suffering from addiction will take multiple doses in a day, racking up the cost to hundreds—or even thousands—of dollars each week. The following list shows the average cost of illegal street drugs per dose and how long the effects of each drug last. Brown powder and black tar heroin run about $10 per gram, while white powder is $15 to $20 per gram. The darker colors indicate impurities, so brown powder and black tar heroin are generally less expensive. The type of heroin that is more prevalent depends on where it is located. Since black tar heroin comes from Mexico, it is more common in southern states. An average dose of heroin is .1 gram. The euphoria produced by heroin lasts only a few minutes, but the following sense of calm and relaxation can last for three to five hours. A gram of cocaine can cost anywhere from $60 to $150. It is highly dependent on purity and location. Cocaine is sold on the street as a white powder or rock-like substance, called crack cocaine. A study in Ohio found that more wealthy people purchase powdered cocaine while those with lower incomes tend to buy crack cocaine, though the prices are comparable. An average dose of cocaine is 50 to 100 mg. Cocaine is often measured in lines (for snorting), and there are about 10 to 20 lines per gram. The high from cocaine is short, lasting only five to 30 minutes. How Much Does Methamphetamine Cost? A gram of crystal meth costs $20 to $60. Methamphetamine may come as a powder, but it is most frequently sold in crystal form. The rise in home methamphetamine labs in the U.S. has increased drug traffic and decreased prices. The Drug Enforcement Administration (DEA) notes that the average price per gram dropped from $98 to $58 between 2011 and 2016. A dose of methamphetamine is .1 to .25 g and the effects generally last six to eight hours, though some people feel it much longer. While many states allow medical marijuana, not all states have approved recreational use. As a result, marijuana is still sold on the street. It comes in different forms for different prices. 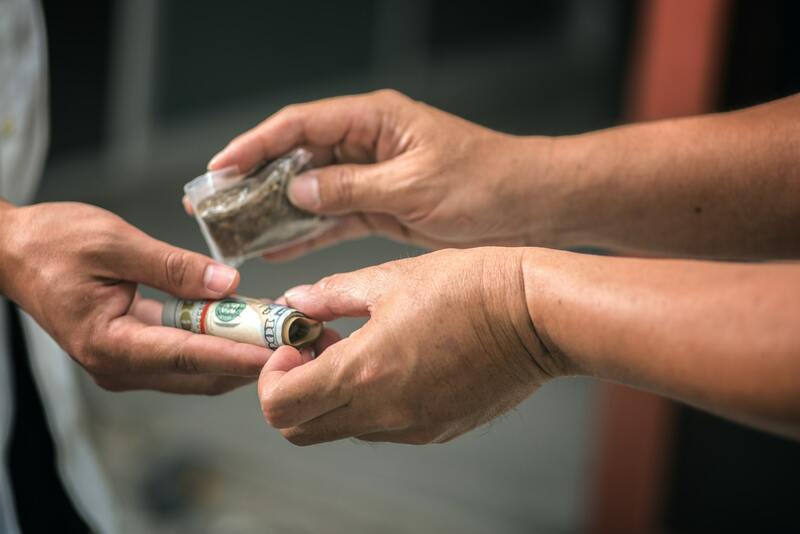 Synthetic cannabinoids, sometimes called “fake marijuana,” are generally less expensive. Spice and K2 (two variations) cost about $10 per gram. A joint, blunt, or edible is a single dose. A dose of cannabis bud may be .1 to .5 g while a dose of oil starts at 25 mg. The effects from smoking bud or oil may last a half hour to 1.5 hours, while edible effects may linger for several hours. How Much Do Synthetic Cathinones Cost? Synthetic cathinones can cost $25 to $50 per 50 mg packet. An average dose ranges from five to 20 mg. These stimulant drugs are sold in packages labeled “bath salts” and “plant food,” so they are easier to sell undetected. The stimulant effects are generally followed by a crash, and the whole effect lasts six to eight hours. Hallucinogens are drugs that intensify the senses and alter the mind. Some of these are called “club drugs” because they are commonly used at nightclubs, parties, and concerts. However, not all club drugs have hallucinogenic effects. Ecstasy (MDMA): A hallucinogenic stimulant drug that costs $5 to $25 per pill, depending on the strength (50 to 150 mg). It is sold as powder in capsules (Molly) or colorful tablets. Effects last three to six hours. Gamma-hydroxybutyrate (GHB): A depressant drug with euphoric effects that costs $5 to $25 per dose. An average dose is 2-3 mL of liquid and effects last up to four hours. Flunitrazepam (Rohypnol, Roofies): An illicit benzodiazepine sedative that costs $5 to $6 per pill. An average dose is one to two milligrams and effects last eight to 12 hours. Ketamine (Special K): A dissociative drug with hallucinogenic properties that costs $60 to $100 per gram of powder. An average dose is 100 mg and effects last only 30 to 60 minutes. Phencyclidine (PCP): A dissociative drug with hallucinogenic properties that costs $5 to $10 per tablet or $20 to $30 per gram of powder. An average dose is 5 to 10 mg and effects last four to eight hours. Lysergic acid diethylamide (LSD): A hallucinogen that costs $4 to $8 per dose, depending on the strength (20-80 mcg). Commonly comes as “blotters.” Effects last 10 to 12 hours. Psilocybin mushrooms: A hallucinogen that costs $20 to $40 for one “trip” (1/8 ounce), and may be anywhere from $50 to $200 per ounce. Effects last three to six hours. The average cost of illegal drugs on the street is also affected by location. Cities with high populations tend to have more people buying drugs in them. This demand allows for prices to be lower than in a rural area where there are not many buyers. Big cities are also likely to have more drug dealers, and competition can keep prices low. Certain cities in the United States are hubs for Mexican drug cartels. Drugs are trafficked into these cities from Mexico and distributed throughout the United States. As a result, these cities are populated with drugs—especially heroin, cocaine, and methamphetamine. More supply means lower prices, whereas drugs cost more in places that do not have as much drug traffic. The purity of drugs also affects the cost. Illegal drugs are usually cut with substances that are similar in appearance. Heroin and cocaine can come in white powder form, and may be cut with materials like baby powder, cornstarch, caffeine, or lidocaine. Cutting agents make drug production costs lower, so they can be sold at a cheaper price. Some cutting agents are harmless. Others are deadly—like fentanyl, a synthetic opioid that can kill a human at a dose of 2 mg. Buyers do not always know what is mixed into the drugs they get on the street. The result may be unexpected overdose or negative health effects due to adulterants that shouldn’t be ingested. The cost of illegal drugs on the street is not just about how much a person has to pay for drugs. If someone overdoses or engages in dangerous behavior while intoxicated, they may end up in the hospital. The healthcare costs associated with illegal drug abuse are high. There is also a cost to society when individuals are incarcerated for drug-related crimes. These crimes include drug possession, trafficking, and violent acts committed during drug deals or as a result of drug effects. Holding a prisoner is expensive, and communities rife with drug trafficking tend to be less safe. A recent study of heroin use disorder in the U.S. found that the annual societal cost of related healthcare and incarcerations is around 51.2 billion dollars. Then there are the costs that are harder to measure. Many illegal drugs are so categorized because they are highly addictive. Drug addiction can take hold quickly and dramatically change a person’s life. When someone is suffering from addiction, obtaining and taking the drug becomes more important than anything else. But addiction doesn’t have to rule their life. Drug rehab centers across the U.S. work to reverse some of the damage that illegal street drugs can cause. The best addiction treatment programs meet people where they are. They work with each individual to create a unique recovery plan for their needs. Individualized treatment gives people the best chance at overcoming issues that contribute to their drug use so they can avoid relapse. A combination of evidence-based treatment methods, such as counseling and behavioral therapy, is the most effective way to address all of these issues.